Last month we brought you the story of how P-22, the resident mountain lion mascot in LA's Griffith Park, was treated for a severe case of mange brought about by the ingestion of rat poison. New camera trap photos show he's recovering well. 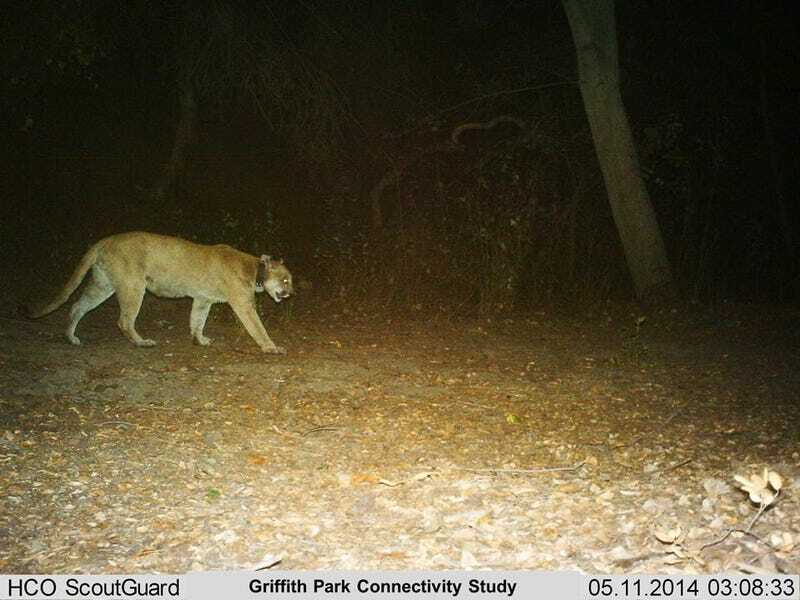 Miguel Ordeñana, a Natural History Museum and Griffith Park Connectivity Study researcher, has been monitoring the continuing health of P-22 thanks to a set of well-placed camera traps. The latest photo, captured just last weekend, shows that he's returning to his former health. Of course, that could all change if he feasts upon another infected creature. There are better ways to control pests than with rat poison. Here, too, is another photo that Ordeñana's camera trap caught: a small bobcat in the same spot just a few days earlier. Notice how much larger the mountain lion is than the bobcat. Photos courtesy of the Griffith Park Connectivity Study, used with permission. The Griffith Park Connectivity Study is an ongoing collaboration between Ordeñana, Dan Cooper of Cooper Ecological Monitoring, and Erin Boydston of the USGS.